Cereals are members of the family Poaceae, a ubiquitous family of monocotyledonous plants whose members are primarily cultivated for their fruit typically called “caryopsis.” The grain consists of bran (outer layer), endosperm (main part), and germ (smallest part) that are a storehouse of vital nutrients. Cereals are a rich and inexpensive source of carbohydrates, vitamins, minerals, fats, oils, and to some extent proteins, providing more food energy to humans than any other crop group. Four groups of foods are prepared from cereals, viz., whole grain products, baked products, milled grain products, and beverages. Cereals are also a rich source of bioactive substances that play an important role in promoting human health. 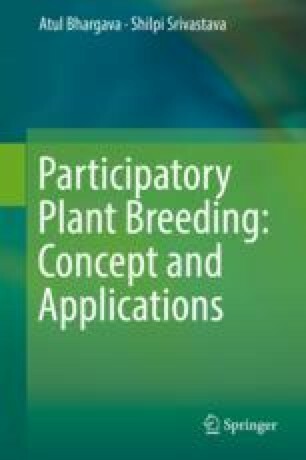 The present chapter discusses the utility of participatory plant breeding in cereal production with special reference to wheat, rice, maize, barley, sorghum, finger millet, and pearl millet.